Is your PPC Campaign tool on Red Bull? 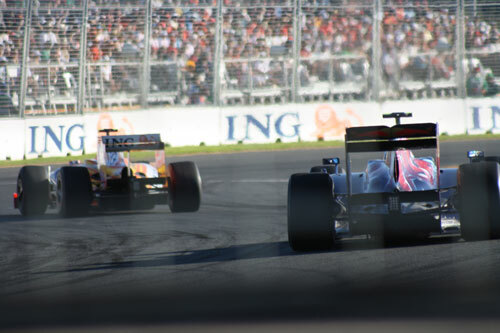 If you follow Formula One racing you will know that Red Bull are suddenly the team to beat in 2011, staying ahead of established teams like Ferrari that have ex-champion drivers in their ranks. Much of their new found competitiveness is down to them now having the best car, which counts immensely in this most technology dependent of premier world sports. PPC marketing is analogous to Formula One in some ways in that the pre-requisites for success are similar. Both need a top-notch driver (Campaign Manager), race strategy (Campaign Optimisations), an experienced team principal (Account Director) and the best in line race car/engine (PPC Campaign Management tool). As I read a recently released report on PPC Campaign Management tools by Search Marketing Now, I was left to ponder on the extent we as Paid Search marketers are dependent on our own PPC tools. So is it all about the tool? I think a good tool can certainly improve campaign efficiency and outcomes especially with large accounts (portfolio of products/brands, active keywords >20,000, multiple online channels). A PPC tool allows campaign teams to automate campaign tasks and provides complex reporting, competitive analysis and cross channel attribution insights all in one place. This frees time to focus on work that cannot be automated, like creative writing, forecasting, developing long term strategies, setting up tests and staying up to date with new search enhancements. I have optimised many campaigns manually or simply through Adwords Editor and the Google/Yahoo interfaces with equal ease though I admit it does increase time required. The decision on whether to rely on a 3rd party tool or to what degree, depends on each Campaign Managers style and the complexity of the account. SMBs and SEM consultants running small or seasonal campaigns might often find working with free tools simpler and cost effective. If you are undecided, the report has a useful section on the pros and cons of campaign automation. Here is a snapshot comparing the leading PPC management tools. Disclaimer: I have not used any of the tools myself so cannot endorse or comment from personal experience. The above list at first glance appears more North America focused to me and hence may be unfamiliar to SEM practitioners locally. But it does provide vital information on the capabilities that leading automated solutions can provide. Remember the PPC landscape today in Australia is not just Adwords and Yahoo, but increasingly also Facebook which according to an AdAge report did 60% of 2010 revenue in self-serve ads, as well as LinkedIn. In a previous post I noted IAB figures showing online advertising in Australia is growing steadily YoY and Search is already 50% of that spend. Read on and make sure your team or Agency is using the best tool on the market.